This survival trapper course will cover absolutely every aspect of trapping that you need to know for your survival and bushcraft needs. Survival is very much a lazy man’s game because of the necessity of conserving calories. For every calorie we burn, there is some kind of food source that must replace that. That is why trapping is King when it comes to eating in the wilderness. TRAPS ARE MORE EFFECTIVE THAN HUNTING! 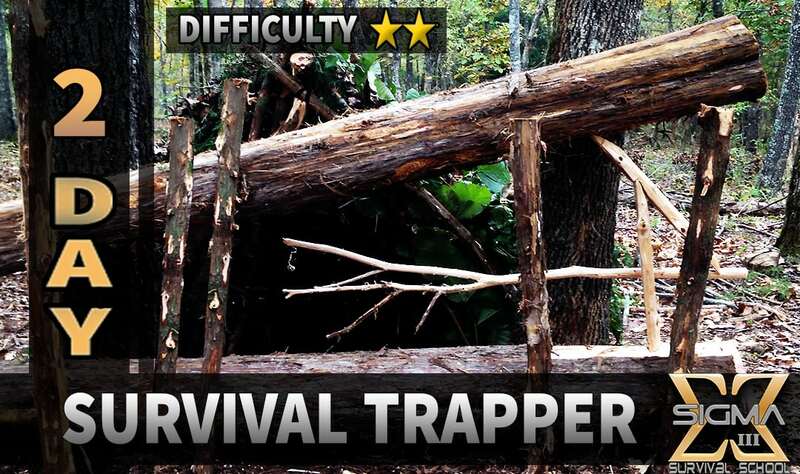 Trapping is such a pivotal skill because traps will work for you while you’re sleeping and when you’re at camp doing nothing. While hunting requires a great expenditure of calories in order to procure that meat. The survival trapper will always eat better than the hunter because it’s a numbers game. With hunting you can only be in one place at a time. With traps you can be in many places gathering food at once. THESE SKILLS WILL MAKE SURE YOU EAT! ANYWHERE IN THE WORLD! This is the most important course you can take from us if you want to eat red meat on your wilderness adventures. We will cover the use of modern steel traps as well as primitive traps that can be constructed with just sticks. Both are highly effective and we will cover the most relevant skills that you need to survive and eat good! THE MOST SUSTAINABLE FOOD SOURCES ARE FROM TRAPPING! This is the checkout page. If you need more details, check out the actual class page. Or better yet, just call us, the phone number is listed below.